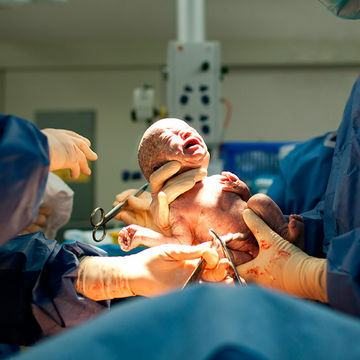 Is Every C-Section Really Necessary? Nearly one in three women giving birth in America have C-sections. But the World Health Organization says it should be more like one in 10. Is it overprescribed? You wouldn't have major surgery unless it was a medical necessity, right? Most people would consider this basic logic, and yet, it doesn't seem to apply when it comes to childbirth. While some Cesarean sections undoubtedly promote the health of the mother and baby, even saving lives in some instances, the World Health Organization (WHO) has emphasized in a recent report that the surgery itself can lead to disability and even death. For these reasons alone, C-sections should only be done when medically necessary. But it seems as though the current C-section rate in the United States—32.7% according to the Centers for Disease Control and Prevention—goes well beyond the roughly 10-15% it should be according to the WHO. It is only these smaller percentages of births that are risky enough to make a C-section the better choice, usually due to abnormal positioning, prolonged labor or a baby in distress. It seems the blame for the excessive C-section rate doesn't fully rest on either the medical professionals or the patients. "I believe that doctors and patients have become a little more impatient with the process of labor," says Sheryl Ross, M.D., an ob-gyn and women's health expert at Providence Saint John's Health Center in Santa Monica, Calif., citing a 24-hour labor as the typical length at which parties often opt for the faster option. Ross also believes there's generally less tolerance to watch an abnormal heart rate pattern, even when it's still in the safe zone. Additionally, she sees a fair amount of C-sections due to macrosomia (i.e. an oversized baby of more than 9 pounds). On the part of patients, some women simply can't fathom pushing a baby out of their vaginas. In her 25 years of practicing, Ross has seen a few women come close to a panic attack over the prospect. This can happen in patients who are naturally anxious, or have had a previously traumatic birth. Perhaps understandably, some of these women elect for C-sections. On the part of doctors, their decisions can seem somewhat driven by insurance companies and malpractice liabilities. According to Sean Daneshmand, M.D., a board-certified maternal-fetal medicine specialist at the San Diego Perinatal Center and the founder of Miracle Babies, "You'll rarely get sued for an unindicated C-section, but you'll get sued for a C-section in an untimely fashion." This means that it's often in the doctor's best interest to err on the side of surgery. This isn't good news for moms and babies, especially since WHO indicates that there are no benefits in terms of mortality rates when C-sections are performed in more than 10% of births. Certainly there are more risks associated with such a major surgery, including scarring in the mother and chronic respiratory problems in the offspring, according to Ross. And although anesthesia and infection control have come a long way over the years, there's still a longer transitional period after birth (e.g. babies have more fluid inside their lungs) and a higher need for the intensive care unit as mom and baby recover. Daneshmand also points to the possibility of placenta accreta—when the placenta attaches too deeply due to a previous C-section (made famous recently by sufferer Kim Kardashian)—which can put a mother at risk for bleeding, losing her uterus, and suffering death. That all being said, every birth should be considered on a case-by-case basis and surgery should always be performed on women who need it. To help protect ourselves as women against unnecessary interventions like C-sections, Ross and Daneshmand strongly urge everyone to do their research, from first-time mothers to those who already have children. "It's important to educate the public on the benefits of vaginal delivery," Daneshmand says.